Imagine answering an ad for a metal guitarist and going on to play in a band that would go on to sell over a hundred million records all over the world. That’s precisely what happened to James Hetfield back in 1981 when he answered an ad placed by Lars Ulrich in The Recycler, a local Los Angeles newspaper. Ulrich’s ad was simple enough – “Drummer looking other metal musicians to jam with” – and he and Hetfield hit it off pretty well. After a number of false starts and different personnel, Ulrich and Hetfield put another ad in The Recycler and found Dave Mustaine to play lead guitar. In early 1982, they added Ron McGovney on bass and Metallica was born. James Hetfield was eighteen when he met up with Ulrich and had been playing guitar for four or five years. He’d taken both piano and drums lessons as a youngster but his love of the band Aerosmith led him to the guitar. He had played in a few local bands. Metallica suffered numerous growing pains in their first year. Mustaine’s behavior, especially when fueled by alcohol and drugs, caused a lot of friction between members. Meanwhile Ulrich and Hetfield were so awestruck by seeing the band Trauma’s bassist Cliff Burton play that they recruited him to join Metallica, replacing McGovney. In spite of all the drama, they managed to write a number of songs and record demos impressive enough for them to get a deal to record. But just before recording their first album, Ulrich and Hetfield fired Mustaine and replaced him with Kirk Hammett from Exodus. Hammett, born in 1962, had been playing in the San Francisco thrash metal scene and had formed Exodus in 1980. Even though Exodus was doing well, Hammett still devoted time to improving his guitar playing. He was a student of Joe Satriani’s at the time he got the call to join Metallica. The band’s first album, Kill “˜Em All, got them a fan base with the metal fans and made it to 120 on the Billboard 200 album charts. Their 1984 follow-up, Ride the Lightning, got as high as 100. And a September show that year impressed Elektra Records enough to sign Metallica to a major contract. Their first album for Elektra, Master of Puppets, released in March of 1986, hit number 29 and spent close to a year-and-a-half on the Billboard 200. In September 1986, Metallica’s tour bus skidded and flipped on a road in Sweden. Burton was killed in the accident. Ulrich, Hetfield and Hammett decided to keep the band going and auditioned several dozens of bass players, ultimately offering the job to Jason Newsted, who had played with the band Flotsam and Jetsam. …And Justice for All, the group’s next full studio album, rose to number 6 on the Billboard charts and also got the band its first Grammy nomination. Metallica also made its first music video for the song “One” from the album. The video gathered the band enough of a new audience to earn it 39th place in MTV’s “Top 100 Videos of All Time,” when it aired in 1999. 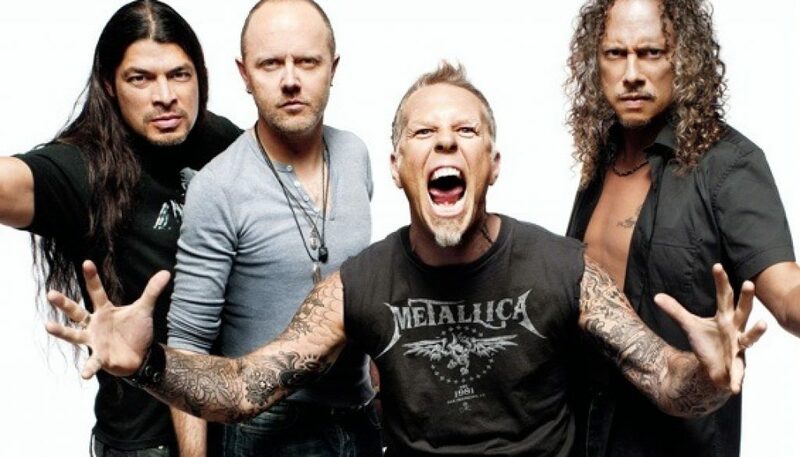 Metallica’s fan base had grown so much that their eponymous fifth studio album, also known as “The Black Album” debuted at the Number One position when it was released in mid August of 1991. Metallica, following the success of “One” from their previous album, was more commercially accessible to both critics and audiences, building a bridge from thrash metal to mainstream. The singles culled from this album, “Enter Sandman,” “Don’t Tread on Me,” “The Unforgiven,” “Nothing Else Matters,” “Wherever I May Roam” and “Sad But True” are all still considered to be among the band’s best even today. Hetfield’s introspective lyrics connected with millions and the album has sold over twenty-one million copies just in the United States. Metallica spend most of the 90’s on the road. The Metallica album tour alone lasted almost three years. On tour with Guns “˜N’ Roses in the summer of 1992, Hetfield suffered second and third degree burns in a pyrotechnics accident on stage. Guitar tech John Marshall, who had previous filled in on tour when Hetfield had broken his arm while skateboarding, took over rhythm guitar chores while Hetfield carried on as vocalist. They also headlined at Woodstock in 1996 as well as Lollapalooza in 1996. But they still find time to write and recorded. Their 1996 album, Load, had a more traditional heavy metal sound, almost entirely abandoning their thrash metal root while exploring a more blues-oriented style. It debuted and spent four weeks at Number One and its 1997 follow-up, Reload (Load was originally conceived as a double album, but the band decided to work on polishing the second group of songs rather than to release them as part of Load) also debuted at the top position in the charts. Bassist Newsted left the band in January 2001, citing “private and personal reasons.” At the time the band was in the process of preparing to record their next album, St. Anger. Producer Bob Rock provided the bass for the album, which suffered furthered delays as Hetfield entered rehab in July of that year. Robert Trujillo took over on bass for the band in early 2003 and St. Anger was released in June (debuting at Number One). It garnered mixed reviews, most of them focusing on the total absence of guitar solos on the album. The subsequent tour lasted two years and the band spent most of 2005 on break, although they did open for the Rolling Stones at two shows in November. Bob Rock stepped down from spending fifteen years as the band’s producer and Metallica went to work with Rick Rubin on their next album, Death Magnetic. It also debuted at Number One, giving the band the distinction of being the first to have five consecutive studio albums debut in the Billboard Charts’ top position. In April 2009, Metallica was inducted into the Rock and Roll Hall of Fame. Both Trujillo and Newsted shared the stage and Ray Burton, Cliff’s father, was there to accept the award for his late son. June 2010 saw Metallica, Slayer, Megadeath and Anthrax (considered to be the “big four” of the thrash metal genre) playing on the same bill for the first time. They are hoping to get back to writing and recording in the upcoming year.